Anyone doing aerobics needs to have their feet protected from any sort of injuries. And what better way to protect your feet than to wear shoes that offer you support, stability and cushioning. 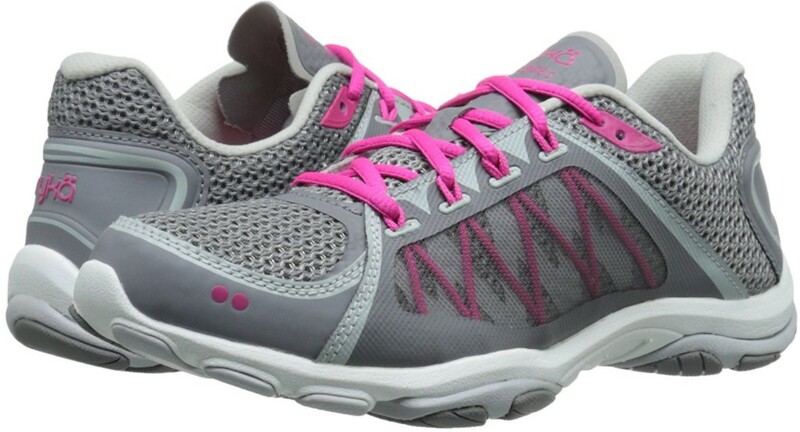 The RYKA Women’s Influence Aerobics Shoe is one of the best aerobic shoes currently available in the market. Here is a full review of the shoe. The fact that an aerobic session is characterised by dance like choreography which often involve moving feet, one need all the protection they can get. The RYKA Women’s Influence Aerobics Shoe is equipped with a dual impact midsole which provides cushioning for the mid-foot and heel. The fast paced bouncing, jumping, stepping and running are particularly dangerous to your feet. You can easily injure your metatarsal if your feet flex a lot. The dual impact protection ensures that your feet remain intact all the time to make your aerobic session run as smooth as possible. The traction outsole which takes on a footprint design provides the shoe with the stability it requires during an intensive aerobic session. The rubber sole provides this cross training shoe with the traction it needs when making quick turns or changing direction. It also means that you reduce the chances of slipping when doing aerobics without limiting any range of motion. The shoe is durable a fact that can be attributed to the rubber sole. The Flex-Foil and Direct-Fuse support layers provides the RYKA Women’s Influence Aerobics Shoe with plenty of support. Aerobics is a rigorous exercise that calls for rigorous movements. For one to perform these with the much needed precision, they need to get maximum support. Everything about this shoe is designed to provide you with that support. From the traction outsole to the dual impact midsole, you can count on the RYKA Women’s Influence Aerobics Shoe to provide you with the same. The shoe was designed with a synthetic and mesh upper for comfort and breathability. Your ankle area needs to be protected when exercising against any sort of injury. The synthetic material provides the shoes with a cushioning factor which is very essential to your ankle when exercising. Breathability is important considering the fact that aerobics is a rigorous exercise. With such exercises, our feet are bound to sweat. The mesh upper allows our feet to ”breath” which in turn reduces sweating. The shoe has some concerns around the heel cup. The heel cup tends to cut off across the ankle which increases the chances of getting blisters around the area especially if it is your first time. Customers concurred that the RYKA Women’s Influence Aerobics Shoes are great shoes for zumba classes. They are lightweight, boast of having a good traction, cushioning and are breathable. Most of them felt that the Cross Training shoe was comfortable and was good to the ankle. It has all the good stuff you need in a zumba shoe; support, comfy, fitting and lightweight. They fit great and have both arch and lateral support. Shoes are very dynamic. For you to find one that is designed for its purpose can be a daunting task. With the RYKA Women’s Influence Aerobics Shoe, you have a shoe that is specifically designed for aerobics. The shoe is designed to make your zumba classes worthwhile. They offer their best when it comes to comfort, and providing the much need support when training. They might not be as stylish but they live up to their expectation. Move to the beat with the Ryka sneaker.